I’ve been reading some recent news about the energy consumption of Bitcoin which seems to have originated from the Digiconomist (https://digiconomist.net/bitcoin-energy-consumption). I’d like to take the opportunity here to respectfully call out their flawed methodology for calculating the electricity consumed per transaction in KWh. I say “respectfully” because of the clickbait-y headline, but hey I really gotta compete for attention to get this out there. I’ve seen other news outlets extrapolate the calculated metrics and spread irrelevant claims about how Bitcoin could be used to power entire countries instead of securing a decentralized payment network. I’ll keep this brief and simple while maintaining a scientific approach and I fully encourage critical peer review of my assertions. The USD value in Step #1 above is subject to fluctuations in the price of a bitcoin. If a miner consumed 1500 kWh in a day, mined 0.1 BTC, and sold it at a price of $5K/BTC, their revenue would be $500. If the miner waited for the price to jump to $7K/BTC before selling it, their revenue would be $700, but for the exact same energy consumption. Therefore Bitcoin’s rising USD/BTC rate would inflate the resulting calculation. The 60% of “operational costs” in Step 2 is not elaborated upon and may include salaries, rent, or cooling costs. 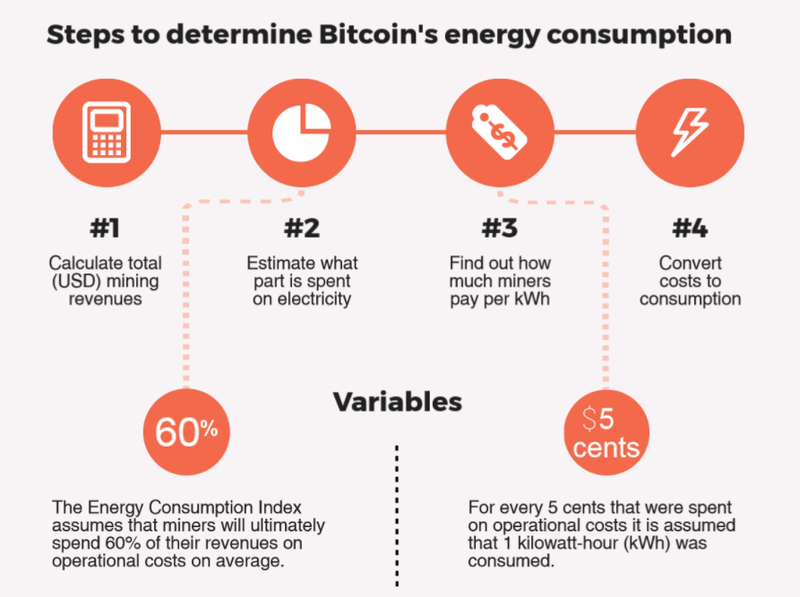 While this may be fair to consider as the “cost of running the Bitcoin network”, it does not accurately represent the true energy consumption per transaction. Instead of starting with revenues in USD, let’s run this by first principles. A single unit of the latest, most energy efficient Bitmain Antminer S9 will pump out 13.5TH/s of hash power and has a listed wattage 1323 W or 1.32 kW. Running this miner for 24 hours will cost about 31.7 kWh. So now the question is how much of the daily energy consumption does this single miner make up relative to the entire network? Blockchain.info lists the value of the total hashrate as of Nov 8 19:00 UTC at just over 11 million TH/s. So the single miner in our calculation makes up about 13.5/11,000,000 or about .0001227% of the network. By constructing a simple proportion we can conclude that if the entire network of miners consisted of the latest, most energy efficient Antminer S9s, the total daily energy consumption of all those miners combined would total about ~25.8 million kWh. Let’s factor in an adjustment by doing the same calculation for a network of less efficient Antminer S7s (4.73 TH/s, 1182 W). This hypothetical network yields ~66 million kWh of combined daily energy consumption that we can average with our all-S9 calculation of 25.8 million kWh to settle at an adjusted 45.9 million kWh. The uncertainty here is the distribution of efficient mining hardware and if anyone has supporting data that suggests a less energy-efficient network distribution for the hash-rate please correct me in the comments. For now let’s just call it an even 50 million kWh consumed daily. With 300K transactions being added to the blockchain daily, that puts us at ~166 kWh per transaction. In the US the average cost of electricity from the grid is about $0.12 per kWh so from the perspective of the average American, it looks like each bitcoin transaction costs $20. And here lies the problem I have with these kinds of headlines. If you had 1 million Venezuelan Bolivars at the beginning of this year, you could probably feed your family for a month or so in Caracas. Today, the same 1 million VEF will buy you a nice dinner. However, it is illegal to publish these kinds of “parallel exchange rates” that expose the hyperinflation in Venezuela and the government stands by it’s most recent official rate of 10 VEF to 1 USD. There are countries where currency controls and economic corruption is commonplace and it’s a shame how many people aren’t more aware of the challenges of the underbanked. Bitcoin doesn’t need to compete with your VISA credit card with a $10,000 credit limit algorithmically calculated using various data points that determine your credit-worthiness as a US citizen. It’s already hard at work enabling immigrants to send money to their families in their home country without a bank account. Bitcoin doesn’t need to help you pay for your McDouble and iced coffee when you can just use the spare change that’s been sitting in your car for 18 months that wasn’t devalued by your government by a factor of 100 rendering it virtually unusable. If we’re going to start talking about how Bitcoin isn’t worth the energy it consumes, let’s make an equally unfair comparison. There are around 200K fast food restaurants in the US alone. One case study puts a 305,000 kWh annual energy consumption (or 835 kWh daily) on an unnamed fast-food restaurant in Southern California. Let’s give a generous 400 kWh daily average and we’re sitting on nice fat energy bill of 80 million kWh daily. In 2004, it was estimated that 300K deaths per year (821 per day) can be attributed to obesity. At our $0.12 per kWh figure, it costs around $11K per death to maintain the obesity epidemic that keeps our healthcare industry afloat. I’ll stop here before my nonsensical extrapolation and manipulation of statistics goes too far, but I hope I’ve gotten my point across. We love creating things with our partners. Occasionally we'll build things for the sake of building them.